We can’t all be Victoria Beckham, but hey, we can breakfast like her — stilettos totally optional. The always-posh fashion designer and former Spice Girl has taken to sharing her favorite morning recipes on Instagram Stories — and they sound super-delicious. 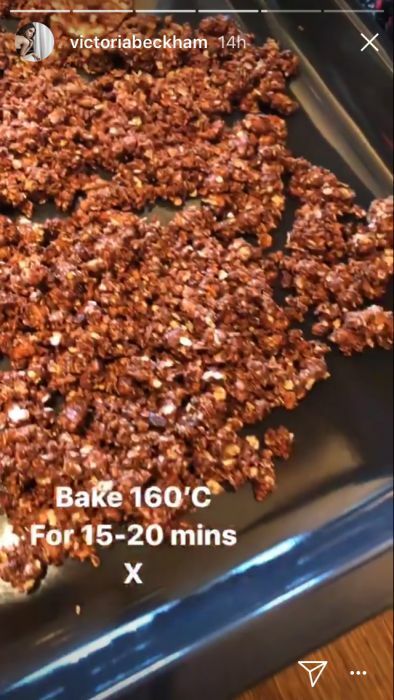 In a short series of videos, Beckham revealed to her fans how she makes homemade Cacao Crunch cereal for her still-at-home kids Romeo, Cruz and Harper (eldest son Brooklyn is off at college in NYC). Want to get in on the wholesome breakfast action? Yeah, we thought so. 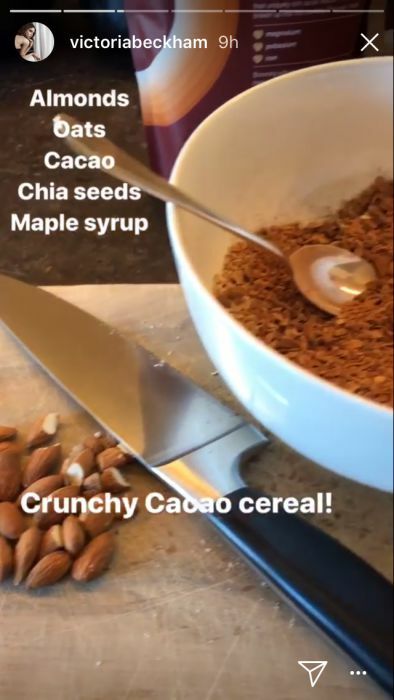 Beckham combines almonds, cacao powder, oats, chia seeds and maple syrup in a big bowl, then mixes it thoroughly. Then she transfers the nutty goodness to a cookie sheet and bakes in the oven at a very Euro-chic 160 degrees C — that’s around 320 degrees F for us here in the States — for 15 to 20 minutes. She’s also a big fan of sprouted grain breakfast cereal with organic unsweetened almond milk. Sprouted grains are at the tippy-top of grain rankings in terms of nutrients, so we’re not surprised health-conscious Beckham is on board. We’re guessing her soccer star hubby David Beckham is probably on board too. Want something to wash down all that crunchy goodness? Victoria Beckham has also let fans in on the secret of her “green monster” smoothie, a weirdly satisfying combination of kiwis, lemons, apples, spinach, broccoli and chia seeds. But the real secret to being the divine Victoria Beckham may be a little harder to swallow: a slurp of apple cider vinegar first thing every morning. Oof. “Be brave! Two tbsp first thing on an empty tummy! x,” she captioned an Instagram post of her favorite medicine: Bragg Organic Apple Cider, which is raw and unfiltered. And unpasteurized. And gluten-free, naturally. So there you go — want to breakfast like the Beckhams? Keep an eye on Victoria Beckham’s Instagram feed and up your family’s morning game.